Muni faces an urgent financial crisis. Costs are rising much faster than revenues. This has already forced Muni to raise fares twice in two years and to cut service for the first time in 17 years. In the years to come, the growing gap between revenue and costs may have potentially dire consequences. Closing this year’s $57 million shortfall was painful, but did not solve Muni’s long-term fiscal problem: based on SPUR’s analysis (see Figure 1), next year it can expect a shortfall of $27 million, $45 million the year after, and $69 million for FY 2008–09. By 2015 the gap is expected to grow to $179 million—a gaping financial hole. To close these gaps, Muni undoubtedly needs to increase and diversify its revenue, but it also needs to cut costs. The agency could cut costs by cutting service, but it can also become more efficient—it can do more with less. Increasing productivity is the only way Muni can improve and expand rather than wither and shrink. If the City does not take steps to improve Muni’s efficiency, Muni may have no choice but to balance its budget with more fare increases and deep service cuts. Though the agency has fared better than other Bay Area transit operators in the last three years—Golden Gate Transit cut service hours by 27 percent, AC Transit by 20 percent, and Santa Clara Valley Transit Authority (VTA) by 17 percent—Muni’s recent 7 percent service cut should be a wake up call. Muni is particularly vulnerable during the next three years because it is unlikely that any significant new revenue sources can be secured and implemented in that timeframe. Muni may have no choice but to raise fares and make still more service cuts. More Muni service cuts will severely degrade transit service, causing some people to abandon Muni altogether and harming those who typically rely on Muni the most—youth, senior, disabled, and low-income residents. The result will be slow, crowded, and unreliable transit that will increasingly be used only by those who have no other options. In this scenario, all will suffer. San Franciscans share a common interest in improving Muni, regardless of whether they ride it. As a city, we must break the vicious cycle we have entered: service cuts, fare increases, employee layoffs, more-crowded transit vehicles, dwindling ridership, worsening traffic congestion, and diminishing quality of life. As the city grows, the congestion that accompanied the economic boom of the late 1990s should be avoided. Just to hold traffic congestion at current levels, by 2015 Muni will need to carry at least a million people per day, 36 percent more than it does today. After the completion of BART and the Muni Metro in the early 1970s, downtown San Francisco enjoyed vigorous growth without adding car trips. Improving Muni enough to attract more riders will help San Francisco continue this kind of desirable economic growth, remain the regional employment center, and become an even better place to live and work. Carrying more people requires Muni improvements, not cuts. SPUR projects that by 2015 the number of trips per day through and within San Francisco (including cars, transit, bikes, and pedestrians) will increase by 403,000. Though some trip growth may be accommodated by more foot and bike trips, if car trips are to be held constant transit will need to carry the bulk of new trips. To successfully meet this growth, Muni must accommodate a larger portion of trips made in San Francisco. If Muni were to increase its ridership by an additional 264,000 trips per day (36 percent) from 736,000 today to 1,000,000 in 2015, the number of car trips in San Francisco per day would hold steady at current levels, so congestion would get no worse than it is today. Daily ridership of 1,000,000 is the target ridership because it represents a conservative estimate of how many new riders Muni needs to be able to carry to hold car trips constant. Ideally, SPUR would like to reduce the total number of car trips, not least because we want to convert some vehicle space into more space for pedestrians, bicycle facilities, and transit. Meeting this target ridership number would result in a modest shift in Muni’s share of all trips made in San Francisco from 22 percent at present to 27 percent. To reach a target ridership of 1,000,000 trips per day by 2015, Muni ridership will have to grow by approximately 3.1 percent each year. At present, Muni expects its planned service increases and improvements to increase ridership by 1.0 percent per year, but at that rate by 2015 it will only provide 841,000 trips per day. While better Muni service is especially important for San Francisco, the entire Bay Area benefits if San Francisco remains an employment hub easily accessed by transit and easily navigated with Muni. A healthy San Francisco crisscrossed by transit options is a strong antidote to the ills of regional sprawl. San Francisco faces a difficult situation. The City needs to attract many more transit riders in order to boost revenues and reduce costs, but Muni is the slowest it has been in 30 years (see Figure 4), costs are rising faster than revenues, service is being cut, and more people are choosing to drive than to ride. To reverse these trends, Muni must change, and elected officials as well as San Franciscans must support that change. While San Francisco must prepare Muni to handle more trips, it is hard-pressed to find the money to pay for Muni’s increasing costs, much less to pay for the necessary expansion of service. As dire as the circumstances sound, Muni is not in an impossible predicament. To make Muni financially sustainable and able to pay for the kind of service San Francisco needs, it must take steps to reduce costs in a way that will minimize its structural deficit. This paper outlines how Muni can reduce costs by providing much faster and more productive service. To reduce costs, Muni must become more efficient. Doing more with less (or much more with the same number of drivers) is simple—Muni must move faster. A fast transit system costs less to operate because it has higher productivity—measured by the number of people a bus or streetcar carries for each hour it operates. Productivity is crucial because, like airlines, public transit has high fixed costs. It costs about the same to run a bus whether it is full of passengers or empty. Labor makes up about 75 percent of Muni’s costs so the marginal cost of going faster (i.e. traveling more miles each hour) is low. The recent success of Caltrain’s Baby Bullet illustrates how faster vehicles can increase productivity (and ridership) and help confront a fiscal crisis. After infrastructure upgrades to allow trains to move faster, the same number of Caltrain workers can offer 96 one-way trains per weekday (including 22 Baby Bullet trains) instead of the current 88. Ridership is up, as is farebox revenue. If average transit travel times are cut in half, the same bus and driver can make two roundtrips instead of one in the same amount of time—so the same driver and bus can offer double the service frequency and passenger capacity for little additional cost. Faster transit can therefore carry more passengers per hour without increasing crowding. Falling productivity is one reason why Muni’s costs are rising: for the last 20 years Muni’s productivity has steadily fallen (see Figure 2), so each year it costs more to carry the same number of people. 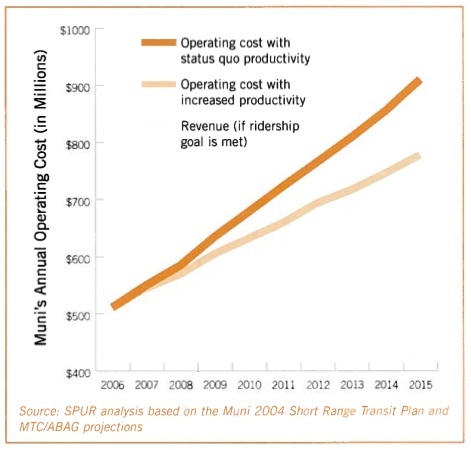 If Muni carries on with the same productivity, then its annual operating costs will increase about 6.6 percent each year for the next ten years. Gradually boosting Muni’s productivity by 20 percent from 63 passengers per hour today to 80 passengers per hour by 2015 will reduce its average expected annual operating cost growth from 6.6 percent to 4.8 percent. A 1.8 percent reduction in annual cost growth is small but nevertheless delivers very significant financial results: it would cut annual budget deficits by between 50 percent and 75 percent for the next 10 years (see Figure 1). This would significantly reduce the amount of new revenue that Muni must find and helps the agency avoid further service cuts. Increasing productivity can be done: public transit systems in Boston and Vancouver have productivities of 75 and 80 passengers per hour. 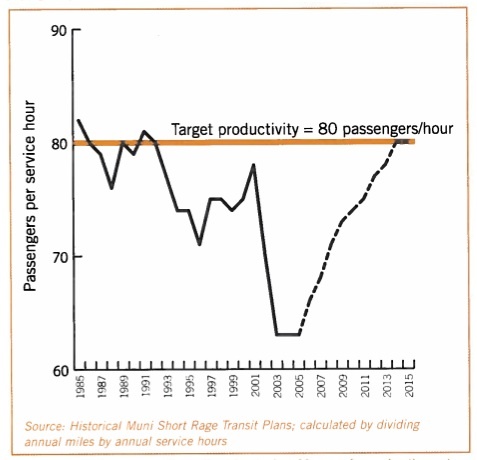 Raising Muni’s productivity to above 80 passengers per hour would restore the productivity to the levels Muni enjoyed between 1985 and 1992. 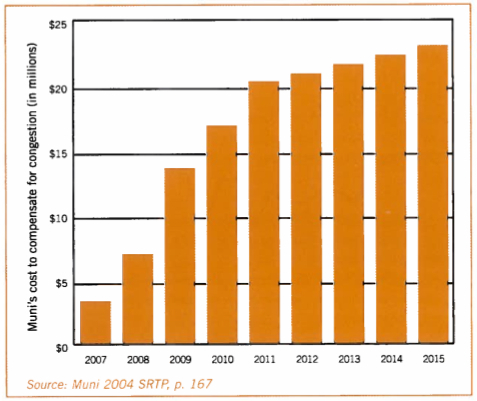 Muni's costs are rising faster than its revenues. Improving service enough to attract more riders and make the system more efficient will narrow the gap between costs and revenues, significantly reducing the amount of new revenue Muni must find. For example, improving productivity could cut Muni's decifit in FY 2015 by 75 percent from $179 million to $46 million. Increasing transit speed is crucial. Because people value their time so highly, it is the fast transit system that gives people what they want—to get where they want to go quickly. Fast transit attracts more riders, is more reliable (because going faster requires reducing unpredictable sources of delay), reduces bunching (one bus coming right after another, rather than being evenly spaced), reduces congestion, and offers the dignity and convenience of the private automobile. People like fast transit service! Muni's productivity has steadily declined for the last 20 years, increasing the cost of providing transit service. Increasing Muni's productivity by 20 percent—restoring it to the levels fo the late 1980s—could reduce its structural defecit by up to 75 percent over the next ten years. Given the benefits of increasing transit speed, SPUR recommends that the mayor, Board of Supervisors, and MTA Board direct the MTA to increase Muni’s average speed by 25 percent on the corridors where it carries 80 percent of its riders by 2009 and then enable it to meet this goal by providing the necessary staff and political support (see Figure 4). This is an aggressive but achievable goal that would attract more riders, significantly reduce Muni’s deficit, and improve the quality of life in San Francisco. Such sizeable increases in speed can happen because some lines now move so slowly. Consider the 38-Geary: during peak times, downtown it averages 5.3 mph. Increasing the average speed of those lines by as much as 80 percent to 9.5 mph would not mean buses would be speeding dangerously through crowded downtown streets—they would move as fast as a leisurely bicyclist instead of a brisk walker. This can be done: many other transit systems around the world have used low-cost techniques to increase transit speeds 25–35 percent (two notable local examples are AC Transit in the East Bay and the Los Angeles MTA). To increase system efficiency and attract more riders, Muni must move faster. Moving 20 percent faster as a system can be achieved by increasing the speed of transit on the main corridors by 25 percent. • Muni formed by consolidating competing private transit operators. Muni is composed of formerly privately owned and operated transit systems that competed against one another for riders. Some of today’s routes are inefficient remnants of that era. • Most of Muni operates in mixed traffic. Operating transit in mixed traffic on congested San Francisco streets harms Muni’s speed, reliability, and cost efficiency. Historically, there has been a notable absence of the political will to separate public transit from auto congestion on our primary transit corridors. With rare exceptions, even today San Francisco’s streets are optimized for the movement of private vehicles, not transit. • Union work rules increase costs directly and indirectly. Over the years, Muni has implemented union work rules that unnecessarily increase the cost of providing service and prevent timely and logical service adjustments. • Rapidly growing cost of employees. Muni employees have generous health and retirement benefit packages that have grown much faster than inflation. As a route is slowed down by congestion, Muni must add more buses to the line to maintain the same frequency of service and passenger capacity. Besides slowing service and making it less reliable, operating transit on congested city streets cost Muni money. Similarly, removing Muni from traffic on transit-only lanes can reduce operating costs because fewer but faster buses can provide the same frequency and capacity. Before Muni was created in 1912, all transit in San Francisco was privately developed and operated. Private enterprise developed the first transit lines along the best natural routings. Typically, real estate developers built streetcar lines to promote new developments, such as the 21-Hayes to the once rural Hayes Valley. Successive developers had to resort to less desirable routes often only one block over because owners of the flattest routes usually refused to share their rails. The Mission District provides one example: at one time rail lines ran on Harrison, Folsom, South Van Ness, Mission, Valencia, Guerrero, and Church Streets—rail lines every block for seven blocks. The result of competing transit systems (and the lower costs that made them feasible) was a remarkable degree of geographic coverage—streetcars served almost every corner of San Francisco—with an equally remarkable degree of inefficient duplication. As Muni gradually acquired private transit operators and consolidated their infrastructure into the publicly owned and operated system that we know today (the last was absorbed in 1952), it inherited transit routes that typically had been developed in inefficient competition with one another. Two striking examples of duplicative routes that remain today are the 26-Valencia, a block from the Mission Street transit corridor, and the 2-Clement sandwiched between the frequent service on the 38-Geary and the 1-California. Some of Muni’s current routes exist not because they make sense, but simply because they existed in the past. Why have some redundancies persisted for so long? This lower productivity route structure might have been financially sustainable in the 1950s and 1960s when fares covered much lower operating costs. 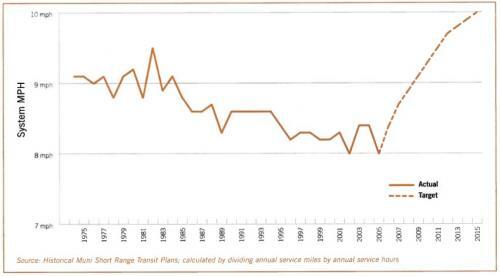 Over the years, as costs have risen, Muni has tried to chip away at the most senseless of these historical routes. But change in San Francisco is not easy; Muni’s attempts to rationalize routings have typically been met with stiff local opposition, at which point professional transit planning often gives way to political accommodation. When faced with disgruntled constituents, supervisors find it difficult to make changes in their districts, even when not changing the system in fact reduces transit service quality for both their constituents and everyone else. Operating transit in mixed traffic on often-congested San Francisco streets reduces Muni’s speed, reliability, and cost efficiency. As congestion gradually erodes the average speed of Muni buses, more buses must be added to each route simply to maintain the same frequency of service and capacity, which increases operating costs. On the 14-Mission, 15-Third, 12-Folsom, 27-Bryant, and K-Ingleside, PM peak travel times increased 20–25 percent from 1992 to 2002. Muni’s speed as a system decreased almost 10 percent between 1985 and 2005 despite a 19 percent decrease in ridership (which should speed up the system because less time is spent boarding passengers). Much of the reason behind this service degradation is that the City optimizes its street operations primarily for vehicle throughput rather than person throughput. On most streets, traffic signals are synchronized to keep cars moving, but transit vehicles are usually out of synch with private cars due to the need to stop and pick up passengers. As a result, buses with 80 people on board are delayed at intersections in order to help move cars carrying one or two people. This gradual erosion of service speed is one reason why Muni spends much more than it should to provide the current level of service. In its budget, Muni calls the cost of adding additional buses to maintain frequencies and capacity on routes “schedule assessments.” This is the direct cost to Muni of congestion. In the years to come, Muni projects that the annual cost of schedule assessments will grow from $3.4 million in 2007 to $23 million in 2015 (see Figure 5). This, of course, does not reflect the cost that congestion has levied over the past 30 years. SPUR believes that Muni can work with its unions to adjust work rules in a manner that will improve its service efficiency, create a better work environment for its employees, and avoid further layoffs. On the other hand, if the relationship between Muni and its unions does not change, both in practice and codified union work rules, then it will be difficult for Muni to implement positive changes to improve service. Unions serve the important role of ensuring good compensation, preventing labor abuses, promoting fair work practices and the dignified treatment of workers, and representing employees during contract changes or disputes. Muni’s unions should be interested in improving Muni productivity, ridership, and farebox revenue because these are crucial to the job stability of its members. If Muni makes these changes to increase productivity, for the next ten years it will probably need about the same number of drivers it has today to provide much better service. If productivity does not increase, more layoffs will be inevitable when service is cut to make financial ends meet. By increasing productivity and rider satisfaction, more importantly, Muni can establish the political base it needs to maintain the number of driver jobs by raising funds through other sources. Because the City Charter sets Muni drivers’ wages, real collective bargaining—putting everything on the negotiating table, wages and work rules included—is not currently possible. This limits the ability of Muni management and the unions to create a better working relationship. A City Charter–mandated floor and ceiling on wages and benefits limits each party’s wiggle room at the negotiating table, which gives little leeway to comprehensively improve work rules. Even something as simple as tying job performance to wages is not currently possible. One of the major tasks of the MTA’s next Executive Director will be to establish a positive relationship with labor. The transit operators union and its membership should be an integral component of the planning effort to make the changes recommended throughout this report. Management and labor should work together to ensure that improvements in efficiency will produce better service rather than layoffs. In exchange, labor should agree to specific efficiency improvements, such as taking advantage of Muni’s existing Global Positioning Satellite system to track the locations of its vehicles, especially on-time pullout performance—one of the most important determinants of reliability—just as other transit agencies do. In the past, Muni was able to provide much more service because the cost of each employee was so much lower. But now employees are expensive. Muni has over 4,000, of which about 2,000 are drivers. The cost of their retirement, health, and workers compensation benefits is rising rapidly. Between 2000 and 2005, Muni’s expenditure on health and retirement benefits increased an average of 12 percent each year. Benefit spending now accounts for 21 percent of its annual budget, up from 14 percent in FY 2001. All large employers struggle with similar pressures, but Muni has not effectively contained these costs. In a budget that is 75 percent labor costs, and with wage increases already negotiated years in advance, the only way to reduce labor costs is to either have fewer employees or to increase their productivity. To cut costs for FY 2006, Muni plans to lay off 200 drivers. While fewer overall drivers may be necessary for Muni’s long-term financial health, providing less transit service is simply not an option. Muni will earn about $120 million in fares in FY 2005, which will cover about 23 percent of its annual operating expenses. Comparing farebox recovery ratios between transit systems is tricky because so many factors contribute to it—fares, density, operating conditions, etc.—but the comparison does suggest that Muni could do much better by increasing its productivity. This year, if Muni's productivity was 80 passengers per hour, its farebox-recovery ratio would have been 28 percent. SPUR is recommending that the MTA undertake a comprehensive planning process to rethink how transit service is arranged and allocated in the City and improve its speed by 25 percent on the transit corridors where it carries 80 percent of its riders. The remainder of this paper outlines the low-cost and technically simple steps the MTA should take to improve service, attract more riders, and reduce its structural deficit. Most Muni vehicles operate in mixed traffic, which reduces their speed, reliability, and cost efficiency. Muni can’t afford to pay its drivers to sit in traffic. Low-cost, high-impact fixes include increasing the speed and convenience of boarding passengers, expanding the transit-only lane network (where necessary, not just where easy) to remove Muni from traffic congestion, and reducing the amount of time spent idling at red lights by retiming traffic signals to favor transit instead of cars and accelerating investment in transit priority signal technology (taking advantage of equipment already installed on all of Muni’s articulated buses). Muni investments to improve transit speed and reliability must reduce the most significant factor in Muni’s speed and reliability on its primary transit corridors—boarding time. Anyone who rides Muni knows that boarding can be a frustratingly slow process, as people must enter through the front door bottleneck, climb stairs, fumble for exact change, and move to the back of the bus before it can resume travel. • Expand proof-of-payment. Muni already uses proof-of-payment (POP) on its light rail system. This minimizes boarding times by allowing all-door boarding. At present, Muni only has enough fare inspectors to cover its light rail network, but the benefits in terms of transit speed and cost savings of expanding POP will offset the cost of additional POP inspectors. • Increase prepaid fare vending. Muni should install fare-vending equipment to minimize the use of time-consuming cash fares at stops that have many boardings. • Prepaid boarding areas. Prepaid fare vending allows prepaid boarding areas that ensure no cash fares are paid on-board at critical stops with very high numbers of boardings. • Low-floor transit vehicles. Low-floor transit vehicles with more and wider doors significantly reduce boarding times by reducing or eliminating the amount of climbing people must do to board transit vehicles. As Muni renews its fleet, it should purchase these types of vehicles. If transit doesn’t work well when streets are congested, then it will always be slower than driving and therefore not the obvious way to move about San Francisco. It is crucial that Muni expand the transit-only lane network that insulates transit from congestion. Otherwise, any speed and reliability gains Muni might realize will erode as congestion worsens. Bus lanes are most needed where roads are most congested. San Francisco policymakers must be willing to accept more auto delay (or displacement of cars to other streets) as the price of having transit work better on streets whose primary purpose is to move transit. This need not happen on all streets where transit operates—different streets have different functions. Cars have clear priority on South Van Ness and Guerrero Streets. However, they also have priority on Mission Street, especially considering that Mission Street is part of the primary transit network. Transit-only lanes are most effective when their streets have enough truck parking spaces to minimize the need for delivery vehicles to double-park. Double-parked vehicles render transit-only lanes ineffective so enforcement of parking laws, self-enforcing design (such as contra-flow bus lanes, where transit runs counter to the flow of traffic), or physical separation of transit lanes is vital. In San Francisco, driving often is not fast, but it can be when compared to taking Muni. People tend to choose how to get around based on travel time. Travel time is usually evaluated in relation to one’s alternatives: how long a trip will take on Muni or by car. They key point is that travel times are relative—which is why even small improvements in transit speed can make a big difference in ridership. Bus-only lanes increase the absolute speed of transit substantially. More importantly, when TPS improvements are combined with bus only lanes, the absolute speed of transit increases substantially. More importantly, transit’s speed relative to other ways of getting around can shift dramatically. For example, as proposed, the recent Inner Geary Transit Improvement project would have reduced outbound bus travel times between Kearny and Van Ness by about two minutes, or 17 percent. In absolute terms, two minutes may seem inconsequential, but in relative terms they become significant when people choose how to make trips. For trips along the Geary corridor, it might now take the typical car eight minutes instead of six to travel from Kearny to Van Ness, and traveling by bus will now take 10 minutes instead of 12 minutes—the relative speed and attractiveness of Muni compared to driving has increased considerably. On some routes, Muni stops too frequently. San Francisco can’t have speedy transit and excessively frequent stops. Improving stop spacing (while respecting San Francisco’s hills and local conditions) is the cheapest, fastest, and easiest way to improve transit speed and ridership. Studies show most people will walk a bit farther if their transit trip is faster—the 38-Geary Limited proves the point every day. Optimal stop spacing strikes the right balance between walk time to access transit and travel time on transit vehicles to produce the highest ridership. Frequent stops have the advantage of providing quick walking access to Muni; on the other hand, transit sometimes stops so frequently that service slows to a crawl. Stops spaced too far apart from one another may allow for quick transit travel times, but insufficient access to bus stops. Muni already has sound walking distance standards (that take into account distance, grade, and service quality) and some routes have already been optimized. A system-wide stop consolidation plan for routes that need new stop spacing could be quickly developed and approved all at once, and then implemented. This would help avoid the perception that certain neighborhoods are being targeted or favored. Muni and its riders would reap the benefits immediately—buses would move faster, service would be more reliable, ridership would increase, and operating costs would fall. Muni should continue to resist the argument that transit corridors through densely populated areas require more frequent stops (if this were true, Manhattan would have subway stops every 100 feet). Mobility impaired people who cannot easily access primary transit routes should continue to be well served by reliable transit that runs on a schedule as well as by paratransit. But designing our entire transit system around the needs of people who are mobility impaired at the expense of the vast majority of riders will lead to the abandonment of transit in San Francisco. The better solution is to make a transit system that treats all riders with dignity as people whose time is just as valuable as that of people who drive, creating a system attractive even to those with other transportation options. Muni should focus on providing very frequent service on primary transit corridors (see Figure 6) for more of the day where it will benefit the most people (and relieve crowding) and reduce the time people spend waiting for transit. About 95 percent of all San Francisco residents are within two blocks of a Muni stop, but this geographically equitable distribution of transit service comes at the expense of Muni productivity and service quality. Muni’s efficiency suffers because transit service is spread out among too many weak corridors. This spread of mediocre service should be corrected when limited Muni resources could be used much more productively in other areas. Muni needs to prioritize and allocate transit resources in the service of social rather than geographic equity. The greatest social and ridership benefits come from the same strategy: focusing service on the primary transit network. Many buses in low-density areas are often nearly empty while buses that travel along high-density urban corridors often bulge with crush passenger loads. Of Muni’s routes, the 15 busiest (18 percent of all routes) carry 60 percent of all trips each day. Focusing service on a primary transit corridor so that buses come every five to seven minutes provides better service to more people than having two adjacent streets where buses come every 15 minutes. Research (and everyday experience in the Bay Area) shows that most people will walk a half mile to access a high-frequency rapid transit line, and at least a quarter mile to a local bus stop. Walking to access rapid transit lines with reliably short wait times significantly shortens overall door-to-door travel times and makes travel times more predictable. Rather than spreading out limited service hours on many parallel streets, Muni must consolidate quality service onto streets a half mile to one mile apart—putting almost everyone within a reasonable walking distance of great transit. Muni need not completely redraw the map—the primary benefit of rethinking how transit service is arranged and allocated would come not so much from the rearrangement and/or elimination of some routes to reduce duplication (though this is important) as from the reallocation of service hours to the primary transit network. The point of rethinking how limited service hours are allocated is not to eliminate geographic coverage—it is to invest more service where it is most productive, useful, and competitive. Once this is done, it is likely that almost 95 percent of San Franciscans would still be within walking distance of some kind of transit but with slightly longer walking distances and less-frequent transit service on routes that are dedicated to providing geographic coverage. This is the tradeoff for significantly improving transit where it can be provided more cost effectively and will benefit the most people. • Ensure primary transit corridors work well. The best approach to rethink Muni service is to increase service frequency on primary transit corridors. On primary transit corridors, Muni should do all it can to continuously improve transit frequency and speed. and stops to minimize costly duplication of service. This will free service hours to increase service frequency on primary transit corridors where they can benefit the most people. infrequent service. Because vehicles pass every 20 or 25 minutes, one must consult a schedule to use them. On these routes, still less service frequency is feasible if Muni improved their reliability so that schedules could be relied upon. • Explore benefits of implementing short lines. The Castro Shuttle, which operates underground between the Embarcadero and Castro stations, is an example of a short line that focuses service on the highest demand portion of a primary transit corridor. On many primary transit corridors, ridership is focused on one portion of the route. Muni should explore how short lines or shuttles could improve service quality on the most critical portions of the primary transit network. • Increase limited-stop and express service. Use of limited-stop and express service should be increased in heavily used corridors where boardings are already focused around major widely spaced stops (including extending the hours of limited stop service). • Establish mechanism to monitor transit performance so it does not erode over time. Create multimodal performance standards for all modes of transportation (car, transit, bicycle, and pedestrian). These must include service speed and reliability standards for the primary and secondary transit network. Once the standards are established and service improved, the MTA should monitor transit performance so that, when necessary, it can take appropriate steps to either maintain or improve transit performance. Increasing productivity relies on increasing ridership. Apart from going faster and offering more frequent service on core routes, Muni can take other steps to increase ridership and farebox income—two crucial aspects of improving its financial viability without raising fares. • Accelerate the implementation of real-time information at transit stops that lets riders know when to expect the next two vehicles—this improvement alone has been shown to increase ridership significantly. • Improve Muni’s ease of use—Muni is a complicated system. By making it as easy to understand as possible, Muni can attract new riders and increase usage by occasional riders. Examples of this type of investment: improved stop signage, a clearer system map, and better wayfinding information. • Make it easy to buy Muni products: right now, it isn’t obvious to the new rider (or even many current riders) where to buy fast passes, tokens, and maps. Muni should sell these in obvious places such as the Muni Metro stations, and allow people to buy passes in advance and have them automatically sent to their homes at the beginning of every month. • Raise standards for the cleanliness of transit vehicles. • Improve Muni’s connectivity with regional transit providers, its bicycle-friendliness, and pedestrian access to transit stops. Maximizes the social benefit of the limited amount of transit service that Muni can afford to provide. Increases capacity on primary transit corridors during peak times without increasing the total fleet size; this reduces maintenance and facilities costs per passenger carried. Additional buses on core routes will alleviate crowding, not exacerbate it. Leverages Muni's capital investments such as measures to improve transit speed and reliability, equipment to provide real-time information at transit stops, and other bus stop or streetscape improvements. More people benefit when capital improvements are focused on routes where the most people are carried instead of spreading the same limited capital investment thinly across many routes. Improves Muni reliability by allowing Muni's overworked field supervisors to oversee fewer routes. As one would expect, the presence of supervisors significantly increases the reliability of a route. Muni cannot aggressively and continuously improve unless it has enough staff. Muni has a grossly inadequate number of planners. While BART carries 57 percent fewer people per year than Muni and has many fewer routes, it has twelve planners to Muni’s four. In politically engaged San Francisco, making changes to the street or to Muni is a very time- and staff-intensive process. Without the necessary resources and people, Muni staff is hard-pressed to attend public meetings, do proper community outreach, and do all the work necessary to improve Muni by initiating, developing, implementing, evaluating, and monitoring projects. Rapidly designing and implementing the improvements that SPUR is recommending will require an immediate bolstering of MTA planning staff. The recommendations of this paper will occupy these additional planners for the next three years, which will give the MTA time to determine its long-term needs for planning staff and to develop an appropriate funding strategy for additional planning staff. In the long term, the MTA needs a dedicated revenue stream to fund an expanded Muni planning group, both in terms of staffing and financial resources, so that Muni can continue to improve day-to-day life in San Francisco. In the last five years, some work rules were changed to lower Muni’s costs. In the short term, Muni management should lower its costs by simply enforcing the rules that already exist. Muni management has some unexercised rights to reduce costs, such as adjusting schedules to reduce overtime expenditures. According to internal MTA estimates, this action alone would save roughly $6 million per year. After exercising its rights within the existing framework as an immediate cost-saving measure, Muni management and the unions should work together to improve service and reduce costs. One example of this would be to take advantage of GPS equipment already installed on transit vehicles as a tool to improve reliability and report on driver performance, helping line supervisors be more effective. Though certain changes may run counter to the unions’ short-term interests, it is in everyone’s long-term interest to reduce unnecessary costs and improve transit service quality enough to boost productivity and build support for new revenue. This is particularly urgent in light of the additional driver layoffs that the pending financial crisis will require as soon as next year. In the long term, the most important step may be another Muni-related charter amendment that would remove Muni driver wages from the City Charter. Muni and the unions may be able to make many adjustments to work rules in the short term to improve service. But in the long term, removing driver wages from the City Charter would allow Muni and its unions to determine a new working arrangement that would be better for both parties. Ultimately, this would provide better, more productive service to Muni’s riders and help avert further service cuts. Change traffic signal timing to favor transit. Install traffic signal priority technology that will extend green lights as transit approaches. Reduce boarding times; prepaid fare vending, expanded proof-of-payment, and low-floor transit vehicles. Reduce double-parking: change parking policies to decrease double parking, and then strictly enforce parking regulations on primary transit corridors. Add bus bulbs so buses do not have to pull in and out of stops. Provide real-time next bus arrival times at transit stops. Respace and relocate transit stops. Provide transit-only lanes and increase their effectiveness by giving them a distinctive color and using physical barriers, textured surface, raised pavement markers, contraflow operation, and/or lane dividers. On core routes with frequent service and traffic signal priority, use headway-based instead of schedule-based operation. This means that drivers do not attempt to slow down in order to stay on schedule– instead, spacing between buses is maintained by releasing buses from the terminus at precise intervals and, when necessary, allowing buses to pass one another. Without headway-based operation, the potential benefit of other improvements will be watered down. San Francisco has a proud history of progressive transportation leadership—it formed one of the first public transit agencies in the U.S. in 1912, led the Freeway Revolt of the 1960s, and adopted a Transit First policy in 1973—but for the last 20 years the City has moved timidly toward a more sustainable and livable future. With the proper political will to change, Muni could become a great transit system in a matter of years. The urgency of the current fiscal crisis provides a unique opportunity to make the bold (but low-cost and technically simple) changes necessary to get Muni moving much faster. The mayor, Board of Supervisors, and MTA Board should direct the MTA to dramatically improve Muni speed as a way to confront its financial crisis, and then support the MTA as it works to realize this goal. With the right determination, leadership, and support Muni can be much faster and reduce its structural deficit within three years. By significantly improving the majority of Muni service within three years, the MTA will address Muni’s fiscal crisis and San Franciscans will start enjoying much better transit service sooner rather than later. Moreover, by planning all of these improvements together, the MTA can do it in a way that is coherent, comprehensive, cost-efficient, and fair to the different neighborhoods. This paper recommends the following approach and timeline for the MTA and City policymakers to adopt and pursue. The funding for these changes is available and the schedule, though aggressive, is what the urgency of Muni’s fiscal crisis demands. 1. Initiate service planning process—October 2005. The MTA should, all at once, develop a citywide plan to improve Muni service. This plan should improve Muni routings to increase service frequency on core routes and reduce costly duplication, improve stop spacing, and develop detailed low-cost plans to increase speed by 25 percent on the corridors where Muni carries 80 percent of its passengers. These corridor improvements can be rapidly implemented after the plan is approved. 2. Secure funding and staff for service planning project—December 2005. The Board of Supervisors should direct the San Francisco County Transportation Authority (SFCTA, the MTA’s funding agency) to provide funding for the MTA to aggressively develop and implement a plan to improve Muni. The limited amount of existing Muni planning staff would not be able to undertake such a large project alone. This will require additional positions and hiring outside help. This service planning project is an opportunity for the SFCTA to start to fund the planning staff that the MTA (especially Muni) needs. The SFCTA should allocate Prop K funding for the MTA to hire at least ten new planners, bringing Muni to the level of BART. This will not bloat Muni planning ranks—this is the bare minimum required for an agency of Muni’s size. These can be hired either as permanent or contract positions that are tied to specific projects and compatible with the Proposition K expenditure plan. These should be hired as soon as possible, no later than March 2006. 3. Conduct service planning process—January 2006 through October 2006. With outside help, the MTA can complete the planning process within ten months. When developing the plan, the MTA should: involve each neighborhood, quantify effects on transit speed and operating costs, analyze the impacts of proposed changes on the most transit dependent (to ensure that there are not inadvertent adverse effects on a particular community), and assess environmental benefits. 4. Make some immediate improvements—January 2006 through October 2006. Muni needs to improve as soon as possible to improve service and reduce its structural deficit. A lengthy comprehensive planning process is right for the long term, but Muni must concurrently make immediate improvements that do not require the environmental review process. These improvements should include: implement the existing plan to improve transit service on Market Street; develop and implement corridor-length TPS plans (including stop spacing optimization) on two corridors (SPUR suggests Mission and Taraval Streets); colorize the transit-only lanes on recently repaved Geary, O’Farrell, and Mission, as well as four other miles of transit-only lane in the downtown core; implement a system to monitor on-time pull out performance (i.e. the time drivers leave a terminal) using equipment already installed on Muni’s vehicles to improve reliability; redesign the system map; expand real time bus arrival information at stops to ten more routes; and create new enforcement “beats” for Parking Control Officers to improve transit speed and reliability on the most important transit corridors. 5. Complete the environmental review process—November 2006 through July 2007. Like any project of this scope, comprehensively changing Muni is likely to require an environmental review process. This is a lengthy, costly, and necessary step. In light of Muni’s urgent fiscal crisis, this process should be expedited in every way possible. The sooner these changes happen, the sooner people will benefit from faster transit service. Whatever changes can be implemented without an environmental review process (such as improved stop spacing) should be approved and implemented as soon as possible so that Muni can start reducing its deficit via speed improvements as soon as possible. 6. Implementation—July 2007 through December 2008. Once approved, implementation should begin at once. Route changes and stop spacing improvements can be changed quickly, but implementing comprehensive improvements on approximately 20 corridors will take time. SPUR suggests that Muni set a goal of having all improvements implemented within 18 months of project approval. Other cities have made similar transformations in short order. At relatively low cost and within one year, Los Angeles increased bus service speeds on two major transit corridors by 25 percent (after a 13 percent decline in speed since the early 1980s) which increased ridership by 40 percent. After this initial success, Los Angeles set about transforming the rest of its transit service: it is making similar changes on 24 transit corridors in the space of 5 years—two corridors every six months. SPUR is recommending a faster planning and implementation pace for San Francisco because the techniques are so simple and well-understood—there is no good reason why San Francisco cannot quickly plan and implement all the low-cost high-impact techniques to make transit work well. In San Francisco, the primary challenge to dramatically and quickly improving Muni is not financial or technical, but political. In our wonderfully contentious and contrarian city, almost any change, no matter how positive, is likely to generate at least some opposition. And the changes required to make Muni move much faster will require real tradeoffs. Like many changes for the better, long-term health and sustainability will come at the price of some short-term discomfort that often is quickly forgotten once the improvements are in place. For example, to make transit work better, policymakers and citizens must be willing to tolerate some increase in walking distance and auto delay, or a small decrease in the amount of on-street parking. Fortunately, existing City policy (starting with the Transit First language of the City Charter) provides ample guidance when considering these tradeoffs. Improving Muni comprehensively and citywide is also the best way to make the tradeoffs explicit. A clear understanding of the net citywide benefits will help planners and policymakers to weigh inevitable opposition to particular changes at particular locations. This will help to depoliticize the planning process somewhat, helping sound planning process to prevail. For this process to result in a dramatically improved Muni, when formally approving plans, policymakers must not pander to short-term viewpoints, however popular they may seem or how vocal their proponents. Muni is in the midst of a financial crisis. The sky really is falling, but just slowly enough that Muni has been able to patch over its structural deficits for the last few years. But now transit in San Francisco is at a critical point: if we carry on with the status quo, in the next few years Muni almost certainly will be required to make deep service cuts (and raise fares still more) that will send San Francisco still deeper down the vicious downward spiral of service cuts, fare increases, employee layoffs, dwindling ridership, worsening traffic congestion, and diminished quality of life. The alternative is simple: Muni needs to move much faster in order to attract many more riders. Though Muni has improved since the “Muni meltdown” in 1998, the people of San Francisco need better. San Francisco is a wonderful city and needs a transit system to match. By following the recommendations of this paper, Muni could be well on its way towards being wonderful—25 percent faster and significantly more frequent and reliable. Though Muni must cut its costs by increasing efficiency, it also needs additional revenue. The financial scenario presented in this paper assumes that Muni will immediately improve service to cut costs and will also earn significant amounts of additional revenue, about $25 million a year for the next five years, then increasing to $46 million a year by 2015. This is between 50 and 75 percent less revenue than Muni would have to find if it were not to improve service enough to raise productivity, but nevertheless is substantial. Improving service citywide within three years will go a long way towards convincing skeptical citizens that Muni is worth additional investment. The goals SPUR has outlined for Muni—comprehensively rethink how service is arranged and allocated, improve stop spacing, and increase speed by 25 percent on the corridors where it carries 80 percent of its riders—are ambitious but achievable. Embarking on a citywide planning process is daunting, but it is a necessary step towards making Muni financially sustainable and dramatically improving Muni service. The MTA will have to lead the process and should not delay—the process should start immediately to confront the fiscal crisis as soon as possible. But this project’s success ultimately depends upon the leadership and support of the mayor, Board of Supervisors, and MTA Board. The author of this report is Jay Primus.